If you work in the fitness industry or are thinking about joining it, you might want to consider getting insurance so you’re covered if anything goes wrong. Not only can insurance pay out if there is a problem, but it can also give you peace of mind, even if you never need to use it. In this article, we talk about the different types of cover available for fitness professionals and dance teachers. We also list the companies that may be able to cover you. Or if you know what you're after, you can get a quote from Protectivity here or Insure4Sport here. If you just love going to the gym, check out our guide on how to get a cheaper gym membership. What types of insurance do personal trainers need? Insurance could cover claims due to, for example, a lack of proper instruction, injury due to an exercise the trainer has asked the client to perform, or injury due to loose equipment or spilt liquid. If you are employed by a gym, the gym's insurance should cover you if anything happens. However, if you are subcontracted - such as if you offer a class in a gym but are not technically employed by it - you might have to find your own insurance. If you're not sure, it's best to ask your gym whether you are covered in the role you're doing, what you're covered for, and for how much. Some personal trainers will be completely self-employed, and offer sessions either one-on-one or with a group. Generally, they will create personalised training programs for their clients. Along with a fitness plan, these might include a diet plan, which means they might need insurance which covers them for nutritional advice. Some insurers will cover this, but it's best to check. It’s not illegal to train people without insurance, but it’s certainly recommended. If you plan on getting it, make sure you have it before your first training session so you’re completely covered. Remember that insurance companies might require your qualifications in order to pay out for a claim. Some companies that provide training for fitness and dance instructors, such as Zumba, require you to have public liability insurance as a minimum before you begin teaching classes with its qualifications. The company may offer its own insurance with some packages, though. Zumba offers a Zumba Combo Qualification that includes a year’s free insurance. Check out our health insurance for gym members group here. Insurance companies expect you to have the relevant qualifications for your fitness business when you take out insurance from them, and if you make a claim they might ask you to prove you’re qualified. If you end up owning your own venue in which you instruct clients, you might want to consider other forms of business insurance that will cover things like the building and contents. 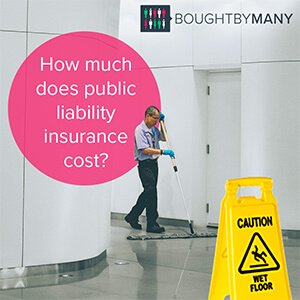 Check out our article on public liability if you’re looking for liability insurance for another type of business. Protectivity offers £1m, £3m, £5m or £10m in Public Liability cover. You're covered to offer nutritional advice, which is important for personal trainers. It offers £250 equipment cover as standard, and you can increase this up to £30,000 if required. The company offers disablement cover up to £50,000, and loss of income for £100 a week up to a maximum of 52 weeks. It'll also cover you for dance fitness classes, such as Zumba. Get a quote from Protectivity here. Markel provides separate cover for personal trainers and dance instructors. Its indemnity cover limits range from £50,000 to £5m, and it offers public and product liability insurance from £1m to £5m. Its employer’s liability covers you for up to £10m. Insure 4 Sport offers public liability cover at £1m, £2m, £5m or £10 million, professional indemnity for £1m and three levels of personal accident cover. The company's highest levels offer equipment cover up to £2,000 – or you can set your own price – as well as loss of earnings cover at either £250, £500 or £750 per week. If you are coaching sports as well, its website features a page which lists all the sports covered by different levels of the policy. Get a quote from Insure 4 Sport here. Register of Exercise Professionals (REP) offers an insurance policy with £10m in fitness cover. The company's insurance covers personal accidents, permanent total disablement up to £50,000 and temporary total disablement of £100 per week. However, REP will not cover you for your own equipment, and its policies don’t cover things like martial arts and dance classes. Professional Fitness offers one catch-all policy - £5m public liability cover and £1m professional indemnity cover. You can choose to add personal accident and sports massage cover for an increased premium, and you can pick whether you need group exercise instructor or personal trainer insurance. Most insurance companies will cover you to instruct anywhere in the UK. Some will include overseas cover for an additional premium. Often overseas insurance will exclude the USA, or the premium for it will be extremely high, due to both relatively high medical fees and because insurance companies think the risk of litigation is higher. Personal trainer insurance from Professional Fitness costs £80.50. This quote was for a 12-month policy for a personal trainer with 1-5 clients. This did not include personal accident or sports massage cover. From Insure 4 Sport, personal trainer insurance cost £53.99. This policy included sports liability for £5 million and professional indemnity for £1 million. REP's personal train insurance costs £56 per year. However, you have to be a member of REP, and joining costs £40. Lots of different factors will affect the cost of your personal trainer insurance. Some insurers ask how long you have been qualified, suggesting your experience will play a role. The age of people you are training will make a difference too, as well as how many of them you are training and what you are teaching them. Whether you have claimed before and whether you have had an insurance policy declined or cancelled in the past will also affect the price of your premium. The insurance that you personally need will depend very much on your own circumstances. Make sure you find an insurance company that offers the cover you require, and don’t get more cover than necessary. Read your policy documents thoroughly so you know exactly what and how much you are covered for. If something goes wrong and your claim gets refused, you might have to fork out for the expenses yourself. Dance teacher insurance is just as important as personal trainer insurance. Public liability insurance could cover you if a student injures themselves under your tuition. Moreover, if you train up a student for an entrance exam for a dance school, for example, and the student is unsuccessful, they could sue you for the money they spent on your tuition. However, professional indemnity insurance can cover you for this. Much like a personal trainer, if you hire a venue to teach, landlord’s insurance should cover you for anything that happens to the building that isn’t your fault. However, if you end up owning your own dance studio, you might want to consider building and contents insurance for businesses to protect against the risk of floods, fires and other natural disasters. If someone sues you and wins, as well as damages, you may have to pay legal fees too. It’s a good idea to have cover, even if you never need to use it. And remember, it might be worth getting business interruption, or loss of earnings, insurance. If you don’t, you might be covered for the damage a fire could cause (for example), but you won’t be covered for the loss of earnings you suffer while you find a new venue or wait for repairs to be made. There are several companies that offer insurance for dance teachers, including Markel, which offers the same cover as it does for its personal trainer insurance. Others include Cover4Dance, a specialist dance insurance company. Cover4Dance provides free dance shows cover, free business equipment cover and free legal expenses cover, all under the same premium. Much the same as personal trainer insurance, the price of your policy will be affected by a number of factors, including your experience and how many students you are teaching. Check out our article on personal liability cover, or find out how to get a cheap gym membership.